Coaster®, the Smooth Driver Monitoring app, ties harsh braking driving to location for risk spotting and risk reduction! Coaster®, the Smooth Driver Monitoring App is useful for changing driver behavior on routes that a driver frequents, such as daily commutes or delivery routes. Coaster monitors driving for sudden hard braking, logs the locations of the abrupt hard braking, and displays locations on a map as markers. Over time, there may be clusters of markers observed at certain locations. The abrupt braking history is displayed while driving and where there are clusters, this display enables and encourages drivers to change behavior and instead “coast” through those areas where frequent harsh braking occurs. In order for the app to provide any value, you (or your group) must drive your repeat routes and let it monitor driving in order to build up a history of clusters of abrupt braking, if any. Most drivers will remain on the default monitoring and map screen. This screen displays the driver’s current location on a map, monitors driving for harsh braking, and displays prior harsh braking markers. Occasionally, the driver may change the detection sensitivity or clear the sudden stop history. This app should be “boring” most of the time. If so, congratulations, you are a “Smooth Driver” on smooth routes. For Individual Drivers – The repeat routes are often the daily commute and frequent errands. This app can be helpful in learning where harsh braking clusters are on those routes. For Fleet Vehicle Managers – Vehicle fleets or sub-fleets often drive repeat routes or routes within the same zone. This app can be useful in learning where abrupt braking clusters are on those repeat routes or within those driving zones, adding to your fleet telematics dataset. Beyond just driver scores, Coaster helps identify risk associated with particular location(s), enabling visualization of the higher risk location(s) and providing the ability for route optimization and/or behavior change. An individual’s sudden stop history is helpful in increasing safety for the individual driver within the fleet or, with the cross fleet event sharing functionality, drivers’ abrupt braking history can be shared for use by a substitute driver, a new driver, or drivers across the fleet. For City Infrastructure and Departments of Transportation – The anonymized aggregate data of drivers within a city using the Smooth Ride app can be helpful in finding clusters of sudden stop activity within that city, indicating potential “hot spots” in the municipality. Longer term, historic data may help influence transportation planning. Short term data, such as spikes, may warrant observation by traffic officers. Coaster® enables detection and visualization of locations where hard braking events occur. They can often occur in the same road segments due to individual driving behavior, group driving behavior, road design, construction, and traffic patterns. 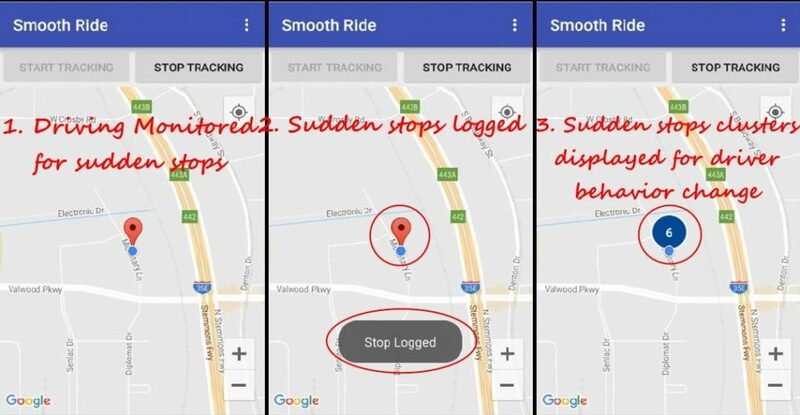 For individuals or fleet managers, learning where patterns of sudden stops are in the daily commutes, errands, or driver routes can be helpful. For municipalities, it provides additional data for traffic flow and infrastructure analysis. 1. This application samples accelerometer and GPS data of the phone to detect when and where sudden deceleration occurs. No additional hardware is required. 2. When sudden deceleration occurs, the location is logged, an alert is displayed, and a map marker of the location is shown. 3. A map is displayed with history is displayed to drivers. On future drives, where the driver drives through a road segment where there are map markers or clusters of prior sudden stops, the display encourages drivers to average their speed or “coast” through that strip. The hard stop detection sensitivity and prior hard stops display selection can be changed in the settings. The hard stop history can be reset at any time.